"Now what is the use of bhakti? Just see how Bhāgavata is compiled, how nicely—because it is transcendental literature. You can say, 'What is the use of bhakti? Why shall I waste my time, come in the temple and hear about Kṛṣṇa?' Actually they are doing that. Nobody is coming. Such a big temple. Of course, there are many temples they are going, but in other places also people have lost interest, all interest. Either temple or church or mosque, they do not go. Therefore they are surprised. In America the Christian priests are surprised because they are closing their churches. In London I have seen hundreds of churches are now closed. Nobody is going. If there is meeting, only the caretaker and few old ladies go. Because why they will go? That's a fact. And actually churches are being sold. It is not lying propaganda. Anyone, English boy, he'll confirm this statement. Yes. People are losing interest. So here it is said that bhaktir utpadyate. The bhakti can be awakened. It is not an artificial thing. If it was artificial thing, why the English and American boys... They had nothing to do with Kṛṣṇa, they never heard in their life about Kṛṣṇa. How... This is admitted by the Christian priest, that 'These boys, they are our boys, and formerly, before this Kṛṣṇa consciousness movement, they never came to church, never inquired about God. Now how it is that these boys are mad after God?' They are surprised. And it is actually surprising. Why? Because the bhakti is there. It was not awakened by the so-called leaders and the priests. It was not awakened. Religion means to awaken that Kṛṣṇa consciousness. That is religion. Sa vai puṁsāṁ paro dharmo yato bhaktir adhokṣaje (SB 1.2.6). That is religion. Religion is not formalities and ritualistic ceremonies. Religion means how to awaken the normal condition, to become lover of God. That is normal condition. Love is there, but because we have no objective, because we have no instruction where to place our love we are loving so many things—up to the dog. Instead of God we are loving dog. Love is there. So bhakti means yato bhaktir adhokṣaje. That means..., bhakti means love. 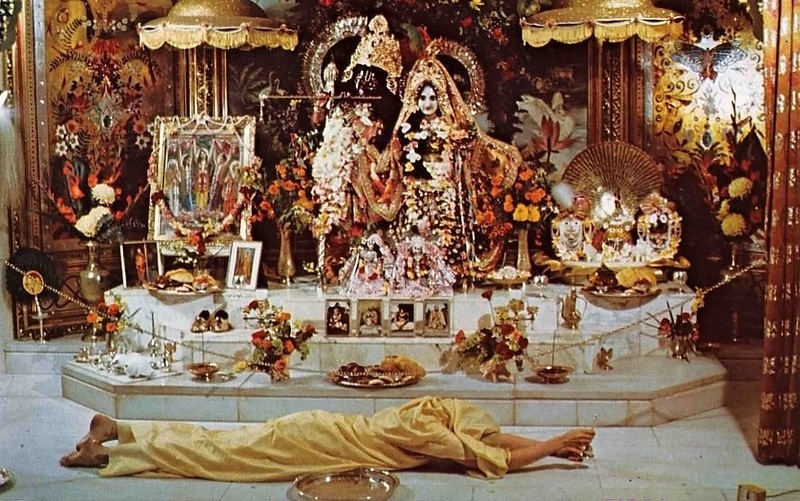 Unless you have bhakti... Just like you are giving me so many garlands. Why you are giving me? Because you love me. Otherwise there was no necessity. There was no necessity. A third person is not coming. But because you have got some love, therefore you are worshiping your spiritual master. So bhakti means love. Without love there is no question of bhakti. So this bhakti has to be awakened. That is stated in the Caitanya-caritāmṛta: nitya-siddha kṛṣṇa-bhakti. Bhakti is there. Otherwise as I have said many times, how you have become bhakta? There are European, American girls here present. For kṛṣṇa-bhakti they have sacrificed everything. Even they do not dress attractively so that they may be attractive to other boys, and their life may be spoiled. Why? For bhakti. For Kṛṣṇa. This is the bhakti. That is wanted. Kṛṣṇe parama-pūruṣe bhaktir utpadyate. This is success of life."